Vegan & GF One Pot Lasagna Soup, loaded with veggies, topped with spinach and fresh tofu ricotta. I cannot believe in all my 42 years of life, I never made One Pot Lasagna Soup. OH had I missed out,,,,,and so have you if you haven’t ever tried this before. Two favorites during these cold months, rolled into one! 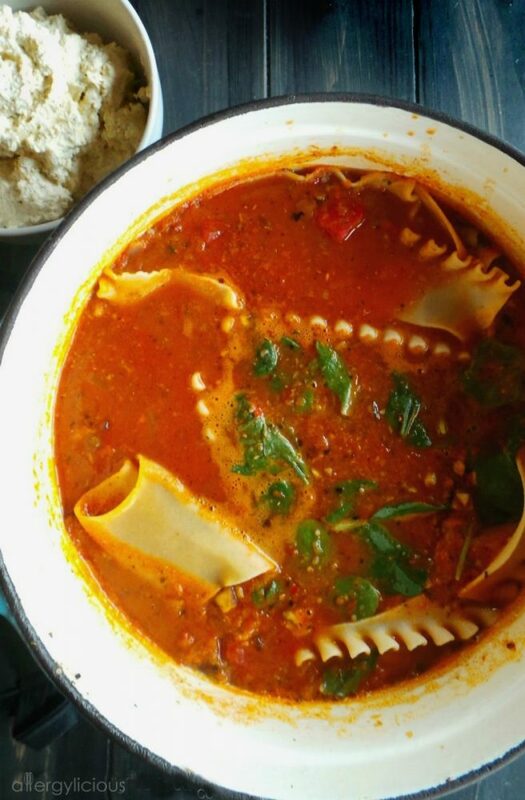 It’s a rich & robust lasagna but in the form of a warm & comforting soup…can you see why it’s simply amazing? AND…I only had to use 1 pot to make this! 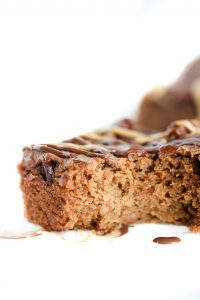 But it gets even better……it’s vegan, gluten-free & free of dairy, eggs, & nuts. 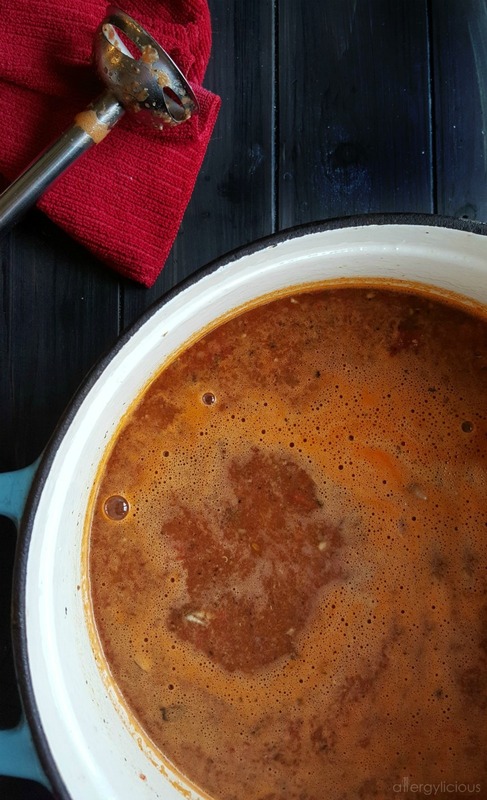 This One Pot Lasagna Soup originally used Tofurkey Italian sausage links, like I used in my Vegan Lasagna. However, since I wanted to make this Gluten-free, I chose to use Sol Cuisine Veggie Breakfast Sausage this time. Feel free to use whatever links your family prefers, or completely omit and add some beans or extra mushrooms in its place for texture. If using vegan sausage, make sure to brown the patties in some olive oil before adding in the other ingredients. This will add so much more flavor! 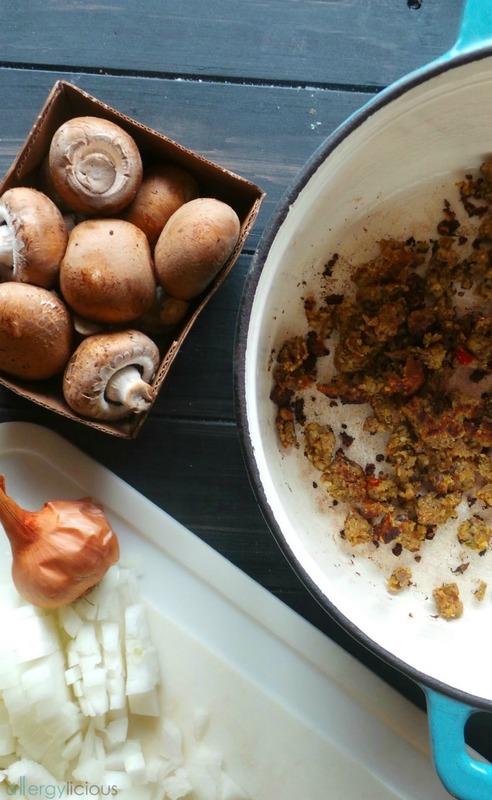 Once it was browned, I broke it apart and little, added the onions and let them cook until tender, then threw in the garlic and mushrooms. Once that is nice and fragrant, add your vegetable broth, canned tomatoes (I used fire-roasted for more flavor) and spices. Don’t turn it on high just yet because you still have to blend the one pot lasagna soup a bit so it’s not so chunky. Although I don’t use my immersion blender (shown above) all the time, I really appreciate having it when it’s needed. If you do not have an immersion blender, then use your blender and pulse the soup in batches until you reach a more desirable consistency. Just be careful…..it’s really hot so don’t fill it up too high. Now it’s time to add your noodles. No need to cook them ahead of time, they will cook perfectly in the soup. If you prefer smaller, bite-sized pieces, either break your noodles ahead of time or maybe you would rather use some fun shaped pasta. I stuck with a traditional noodle and layered it in the pot, making sure to submerge each layer so they didn’t stick together. Gluten-free noodles work perfectly in this soup but if gluten-free isn’t an issue for your family, any lasagna noodle will do. While the noodles are cooking, now is the time to make the Tofu ricotta. This by far, my favorite recipe for a Vegan ricotta as I’ve used it in numerous recipes, like my Vegan Lasagna & Vegan Lasagna Roll-ups. 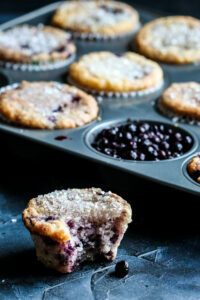 I love that it is easy to make, stores well and is free from nuts, which is hard to find. Once your noodles are cooked to perfection, add in your spinach. I used several cups which not only added nutritional value to the lasagna, but it also brought some pretty color to the pot. 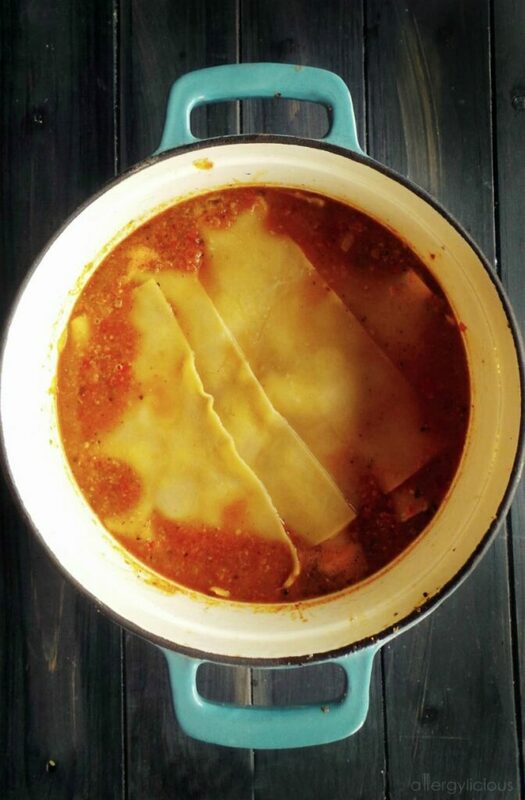 One Pot Lasagna Soup is made a little creamier by adding 1/2 cup of ricotta to the pot before serving but you can leave it out and allow each individual to add it at the end with their cheese, if you prefer. We ended up doubling up on the ricotta since everyone still added a dollop or two of this wondrous mix. Set a large soup pot over medium heat and drizzle olive oil. Add the chopped “sausage” and let brown, 5 minutes. Add the onion and mushrooms and cook, stirring occasionally until soft, 5 minutes. Add in the garlic and stir 30 seconds, until fragrant. Slowly, pour in the canned tomatoes and vegetable broth. Stir then add in herbs and spices. Using an immersion blender, blend the soup ingredients until a more consistent (less chunky) texture. OR using a blender, pulse soup in batches to reach desired consistency. Bring to a boil then simmer. Add lasagna noodles to the soup pot (leave whole or break apart for easier serving) , stir and cover. Allow noodles to cook according to package instructions (6-10 minutes). While soup is simmering, make your tofu ricotta. During the last few minutes that your soup is simmering, stir in 1/2 C. Tofu Ricotta and mix well. Re-season if necessary then stir in the spinach and cook until wilted (1 minute). Ladle soup into bowls and top if extra ricotta or cheese of choice. I wanted to traditional lasagna flavor (for my non-vegan friends) which is why I used the sausage links. Feel free to omit completely or substitute cannelli beans for the protein.Noodles taste best “al dente”. Remember, they will continue to cook, even when you remove the soup pot from the heat. *This heats up great the next day but keep in mind that the noodles may continue to absorb some of the liquid. If this happens and you prefer a more soupy soup, just add some more vegetable stock and a pinch of seasoning. The temperature is dropping 20 degrees today which leads me to ask…..What’s your favorite, comforting soup? What warms you up when it’s cold outside? Comment below & please share your photos or comments when you try this soup. Be sure to tag @allergylicious so I can find it on IG! 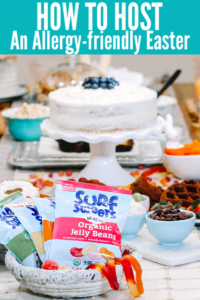 Sign up for the Allergylicious newsletter for a fresh serving of content delivered every week to your inbox! Grab a copy of my eBook and stay in touch on Instagram, Facebook, Twitter and Pinterest for all of the latest updates. This looks incredible!!! And so much easier than making lasagna the traditional way! Love the tofu ricotta!!! Thanks Sarah! It sure is easier, without compromising any of the flavor. What a delicious idea, my husband loves soup! I can’t remember the name of the shape, but we actually have some gluten-free noodles that kind of look like mini pieces of lasagna. They’d be perfect for this! It’s always a hit with the kids so I hope yours love it as well. Sometimes we omit the vegan sausage and replace with lentils, so it’s very versatile. Enjoy. Wow!! I had never heard of lasagna soup before, what a delicious idea! Oh yes, you must try. It’s my lazy lasagna idea but tastes so so good. Please do…we use this ricotta in as many recipes as possible. A perfect recipe for autumn weather. Thanks for sharing! 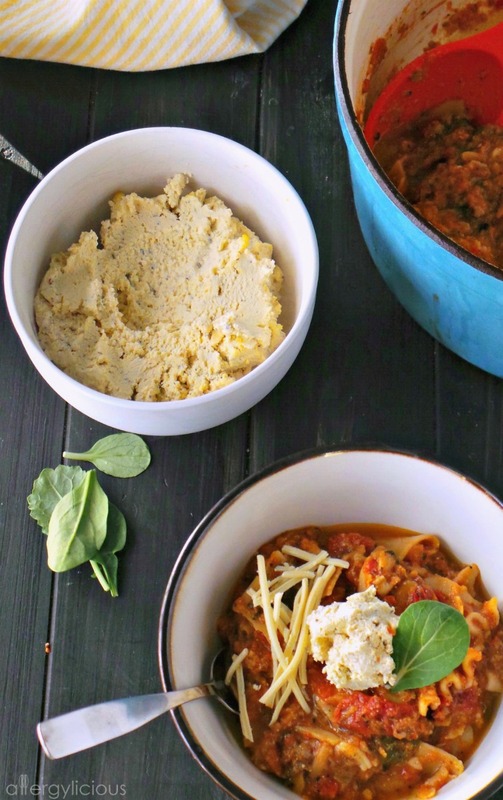 lasagna soup OMG i love lasagna but have never head it as a soup, going to try this for sure! Oh yes, it’s the perfect cold weather, warm you up from the inside kind of soup! Enjoy. Would you recommend squeezing the tofu before it transforms into ricotta? I am just curious if it will effect the outcome. Last time I made this recipe I did not and it turned out amazing. Yes, I would squeeze out your tofu to allow the flavors to soak in. Too much liquid will prevent that from happening. And feel free to adjust to spices to your liking.